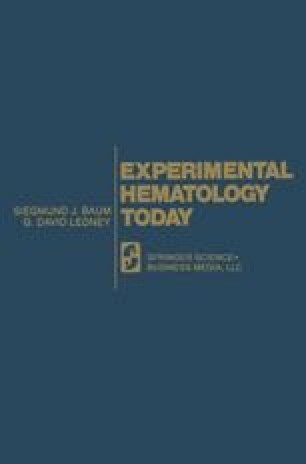 The revolution in experimental hematology brought about by the introduction of colony assays for hemopoietic progenitor cells is still running its course. Colony assays have now been described for pluripotent stem cells (20), granulocyte and macrophage progenitors (3, 10, 13, 16), erythropoietic progenitors (1, 18), megakaryocyte precursors (12, 15), B- and T-lymphocyte precursors (5, 14, 17), and cells in leukemic marrow (4). For all the above cell types except pluripotent stem cells, the assays involve colony formation in cell culture. There is scope for more advances along these lines as culture methods are refined further, particularly in regard to the development of a culture assay for pluripotent stem cells.